With thick edges, an extended sweet spot, a slight bow and an oval handle for comfort and control, evoPOWER sets the benchmark for optimum balance and power. The new EvoSPEED bat collection sets a new benchmark to deliver high performance hitting power with re-weighted balance and control. 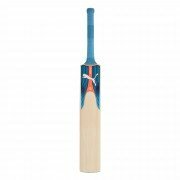 By repositioning the bulk of the willow throughout the main hitting area of the blade, along with a slightly flatter face, it has allowed EvoSPEED to bolster the thickness of its edges, and combined with an impressive swell to produce a destructive bat. Superior pick-up remains the focus of a blade that is beautifully contoured with flowing edges from shoulder to toe. Ultra-modern design, lightweight construction and striking cosmetics, a perfect combination for the modern high impact player. Puma EvoSPEED bats are designed for players looking for a supreme level of performance that combines quality and craftsmanship with consistent levels of high impact hitting power. The Very Best Grade 3 English Willow is chosen to become an EvoSPEED 3 bat.